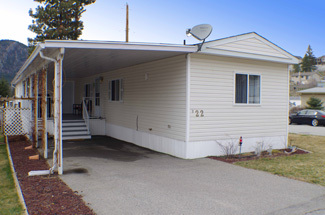 Immaculate 2-bedroom, 2-bathroom mobile home in quiet Peach Cliff Estates. This 1995 Moduline is the classic design: a bedroom at each end featuring an open living/kitchen/dining area in between with vaulted ceiling. The current owners have tastefully updated and redecorated this home and even added a two-piece ensuite in the guest bedroom. Enjoy the large south-facing covered deck. There's a fenced-off area with vines and a small garden. Underground irrigation. Attached is a 180 sq.ft. workshop plus an 100 sq.ft. storage room. And at the back of the property is a separate storage shed. New roof in 2015. All upgrades have permits. Pad rent is currently $483. RV parking is available in the park at $25/month.